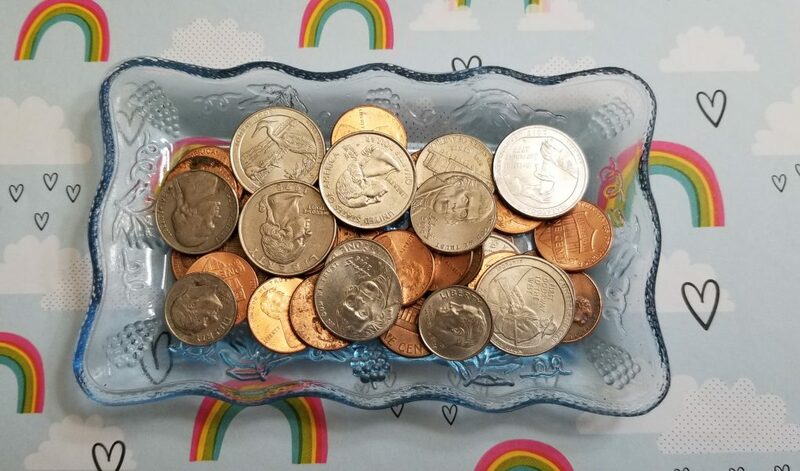 Today, I am asking a friend to guest post – our first one – and give you some tips on saving when buying in bulk. 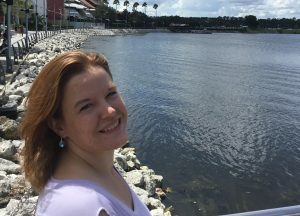 Andrea is an award winning blogger that I recently started following. 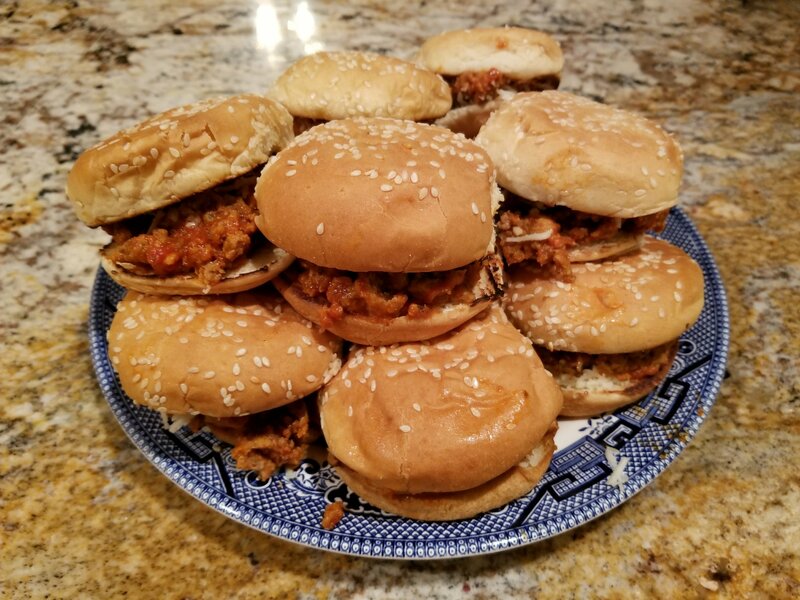 Check out her blog “Saving Joyfully” and find out how she keeps her family focused, fed and on budget each week. Little savings each shopping trip add up to big savings at the end of the month. Every few weeks my husband and I make our grocery trip to Costco. Warehouse stores like Costco are great resources for bulk deals on products if you have one close by. I definitely do not use Costco to purchase everything for our weekly groceries. I love buying certain items in bulk, however buying everything in bulk does not make good financial sense. We often find that with weekly sales, grocery coupons and rebate apps, we often find better deals at other stores on specific items. So what exactly do we purchase at Costco? 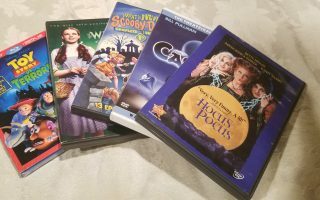 Why do we choose to purchase these items? 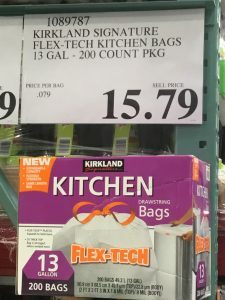 Trash bags are on the list of items, that we have discovered significant savings on when purchasing at Costco. The large amount that you get and the Kirkland brand is actually really durable and worth trying out. 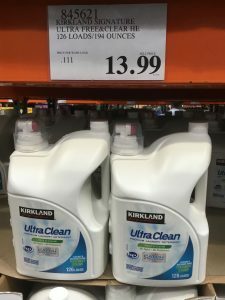 Costco has great prices on laundry detergent. I have found that the Kirkland brand works really great. Why spend more for the name brand when the store brand works so well? We usually purchase the free and clear liquid detergent, but they have both options for free and clear and the regular scented formula. 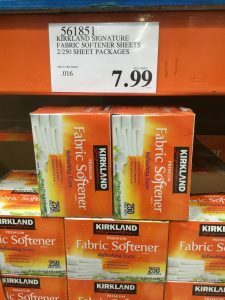 Costco offers a large amount of dryer sheets in a two pack. These are very cost-effective. We usually purchase the Kirkland brand in the dry sheets because they are an excellent quality for the price. 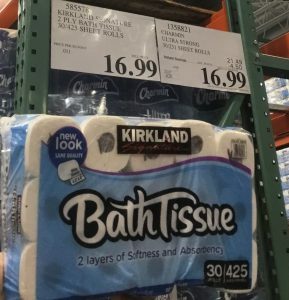 Costco offers both name brand and Kirkland (which is their store brand) of toilet tissue and other paper products. We always purchase Kirkland brand paper products and are very happy with them. The Costco store brand of toilet tissue is a quality product for a very reasonable price. Have you ever bought cheap toilet paper and been irritated with the quality? This absolutely has not been our experience with Kirkland brand. 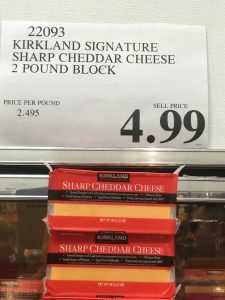 We purchase the large bar of Kirkland cheddar cheese frequently to help stretch our grocery budget. Many recipes we make frequently call for cheddar cheese and this large bar really lasts. The price tag makes it especially attractive and saves us significantly over buying the smaller bars more often. In our household the only thing we use almost as much as cheese is sour cream. We love the stuff and can easily go through a container this size in a month. We purchase the Costco size for both the convenience and the savings because it does save us significantly. Buying in a larger amount also decreases unnecessary trips to the store and saves on waste. 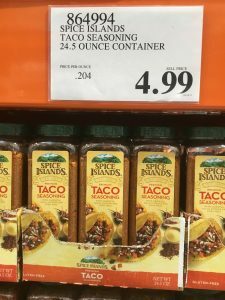 I love buying many types of seasonings from Costco to maximize savings. I purchase taco seasoning, Hidden Valley ranch powder and chili seasoning to name a few. These save a lot of money for us throughout the year because individual packages of these, can cost anywhere from $0.50 to $1.50 a package. Finally we save a lot around the holidays buying disposable dishes for parties and get-togethers. Whenever you find it is necessary to purchase plastic tableware and disposable plates this is a great place to buy them. You can get a large amount of these for a very reasonable price throughout the year. I have found the holiday sales on these products make this the best time to stock up. 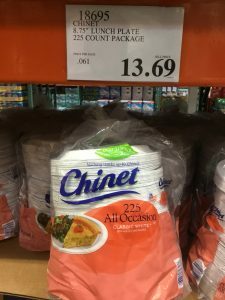 There are many other great deals at Costco, that help me both stretch my budget and also stay on track eating healthy. 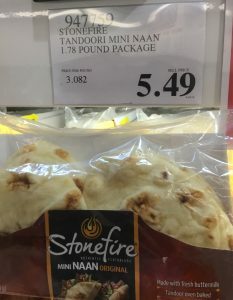 We often purchase the 18 pack of mini naan bread at Costco. We love to get adventurous with different ideas and often turn these into mini pizzas and flat breads. The naan bread is a great value for the price and offers a healthy yet quick meal option. 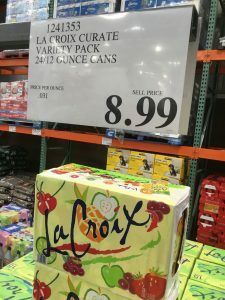 Lacroix are not entirely budget friendly beverages, however these have helped me to successfully give up soda over the last few years. The cost in the normal grocery stores for these can be ridiculously expensive. Buying them in bulk really increases savings. Try one and see what you think, you may be pleasantly surprised that you also can finally give up soda. If I can give up my Coca-Cola fix and opt for this without going back, I believe anyone can. Who knows, it just might work for you too. Think about what you use the most and what you could potentially save on when buying in bulk. How can you maximize your savings by purchasing items in bulk? What items will provide the best savings for you and your family? Hopefully you will find some suggestions in this article that can help you to stretch your own grocery budget. If you do not have a Costco near you, there may be a different warehouse store such as BJ’S or Sam’s club that can offer some of the same benefits. Each family is different and the saving and items suggested here may vary as far as the savings provided to you. I love Costco! Some things really are less expensive to purchase there! Me too. Andrea is really a great resource for these things! This is a great post! I am ashamed to say I do not have a Costco membership. I need to get one. The problem is its just me and the hubby and we have a tiny house with little storage. We keep going back and forth about getting one. Perhaps we need to revisit the conversation. Thanks for this wonderful list! I actually have a Sam’s and many of Andrea’s tips apply there as well. I have loved it! We stock up at Costco every week. It definitely helps us get the most from our money, specifically the products we use a lot. 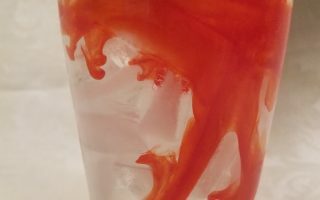 This is a great post by Andrea. 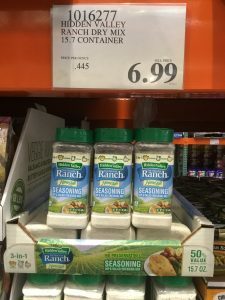 I go to Sam’s or Costco once a month and get several items that really help me save in the long run! Thank you so much for featuring me today Carly. I enjoyed creatting this post for your website and hosting your post on my website. You are awesome. Thank you for sharing your talents and being so supportive! Great post. 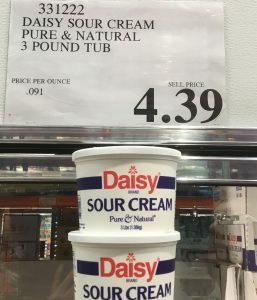 I wish I could go to Costco because I see so many posts and videos about all the crazy savings there, but unfortunately, the closest Costco is 8 hours away and that doesn’t really help me out. I do like the warehouse clubs for some things, but you have to watch the unit cost or you could wind up paying more and think you are getting a deal! I sometimes do better with coupons at the regular store.